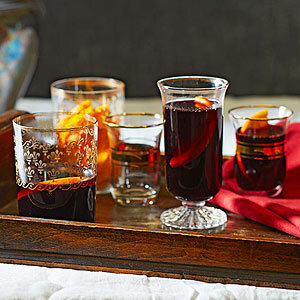 If you like, garnish cups of chef Gerard Craft's Italian mulled wine with thin orange slices or pretty curls of orange peel. This recipe multiplies easily and can be made ahead and reheated before serving. In a medium saucepan, combine the wine, orange slices, cinnamon, cloves, star anise, lemon zest and nutmeg. Bring to a simmer over medium heat. Remove saucepan from heat and stir in sugar until dissolved. To serve, strain mixture through a fine-mesh strainer. Serve hot wine in small heatproof mugs or glasses.